There are few things that raise the hackles of Canadian consumers more than the cost of telecom services. But when it comes to rising internet costs at least, experts say Canadians have only themselves to blame. There are few things that raise the hackles of Canadian consumers more than the cost of telecom services. But when it comes to rising internet costs at least, Canadians may have only themselves to blame. "There isn't a lot of price elasticity [because] consumers aren't leaving," says Prof. Brynn Winegard, who teaches the neuroscience and psychology of consumer behaviour at York University's Schulich School of Business in Toronto. 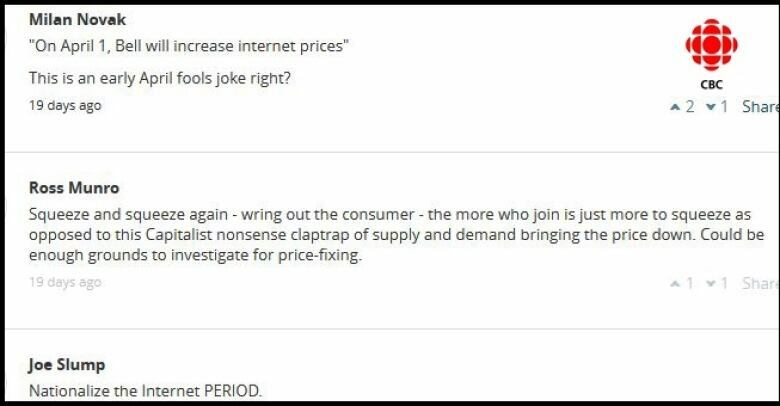 "They know they can get those prices from those consumers." says Winegard. Two of the big telecommunication providers — Bell and Rogers — announced earlier this month they were raising home internet prices, the second increase in the past 15 months. The hikes prompted a flood of complaints online, but numbers indicate few of those angry customers are likely to switch to a lower-cost provider. There are more than 550 resellers of high speed internet in Canada. These are smaller companies that lease network access from the big providers at wholesale prices then turn around and sell internet plans to consumers. On average, these smaller companies charge significantly less for internet service than the large incumbents. 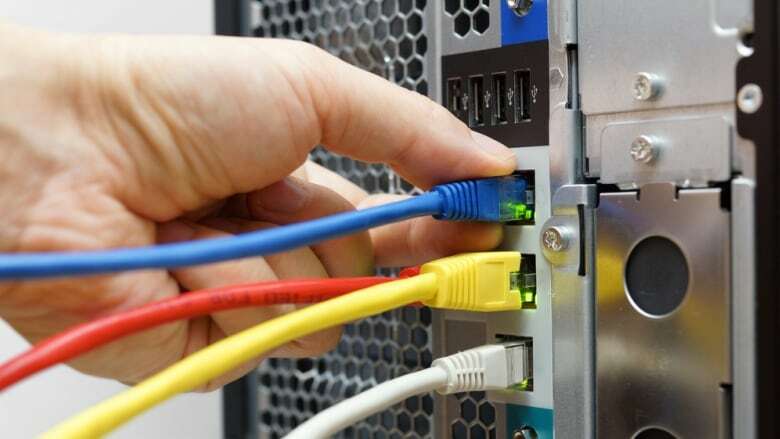 According to a report by Nordicity, for plans with speeds between 16 and 40 megabits per second (mbps), the small companies are 24.52 per cent cheaper. The discount was even greater for other speeds, except the very lowest and the very highest, where the discount was 20.32 per cent and 17.91 per cent, respectively. 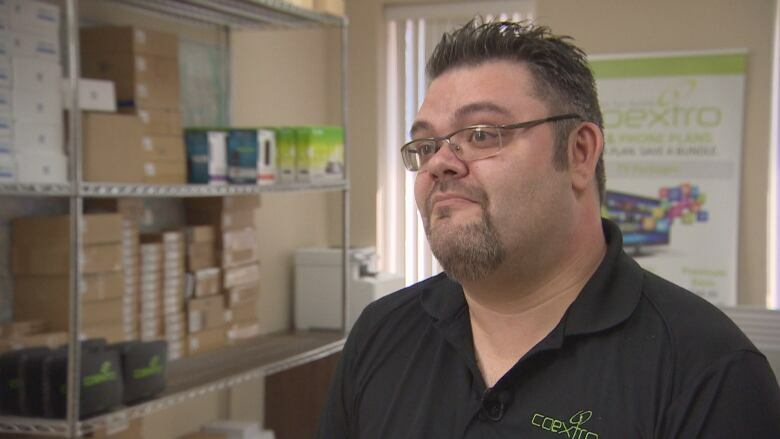 These resellers have been operating in Canada for eight years, since the CRTC changed the rules to allow third party network access back in 2010. But while resellers make up almost 70 per cent of the service providers in Canada, they earn just four per cent of the revenues. Bell, Rogers, Telus, and the other large incumbents still account for 87 per cent of residential internet subscriptions in Canada. 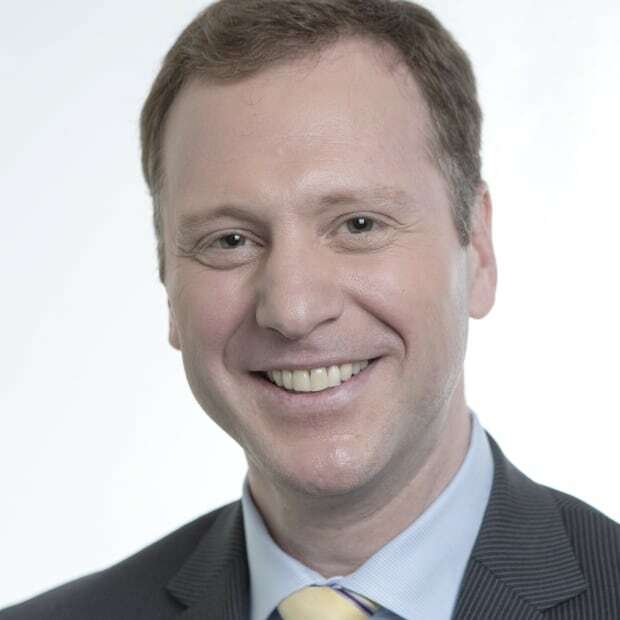 Colin Legendre is president and chief technology officer of Coextro, a small Ontario internet service provider based in Toronto. So even though they could save money by switching to a smaller provider, Canadians overwhelmingly stick with one of the big players. The answer to why lies deep in the Canadian psyche. According to Winegard there are four main reasons why consumers pass up opportunities to save money. The first is fear of change. "There's a real cost to making the wrong choice," she says. "This is equated as consumer risk. Consumers are always trying to mitigate risk by going with the one they know, the devil they know." The second reason: Trust in the establishment. Through their near-ubiquitous marketing and branding, big companies drive familiarity, and familiarity drives trust. Canadians, Winegard says, implicitly trust big, established players more than smaller, less familiar companies. Third is habit. Once a company gains that trust, consumers rarely leave, even if a company breaks that trust. Winegard says a good example of that is the recent Loblaws bread price-fixing scandal. Despite a significant drop in consumer trust, in the final quarter of 2017 sales were up. Another example is the Canadian banking sector. According to a report by the Competition Bureau "despite the availability of alternatives, only 31 per cent of Canadians trust transparency in pricing by the "Big Five banks", [yet] nearly 71 per cent of Canadians still choose one of the "Big Five banks" as their primary financial institution." The fourth may be perhaps the most interesting reason. Research suggests if there's a big price difference that's all the more reason to distrust the discounter. "Consumers are using price as value." says Winegard. "So if you cut and slash your prices, it means that your product, your services … you're implicitly messaging, that they're valued at less, they're less valuable." Americans trust the free market more than Canadians, says Winegard, and are more willing to switch brands to save money. "Canadians are … less trusting of the free market," she says. "Canadians are also more value-conscious, less price-sensitive, compared to Americans. "So what we see from Canadians is that they will put their money toward things that they value or that they perceive value in." It is a challenge competing against the larger carriers," says Colin Legendre, president and chief technical officer of Coextro, a small Ontario internet service provider based in Toronto. Founded in 2012, Coextro has seven employees and about 10,000 customers across Ontario. It has plans to expand nationally, starting with Quebec. Coextro customers get their internet over the same networks as the larger carriers. Every Coextro plan comes with unlimited data. And compared to the big providers, Coextro plans cost about half as much. Legendre says Coextro has never raised its prices. And yet he says it is still a struggle to get people to switch. "It's quite frustrating. That's the biggest challenge we have. We're doing well. But how come we're not getting more volume?" There are other reasons, of course, why people don't choose smaller companies, not least because many people haven't heard of them. Coextro has no advertising budget. It gets most of its customers via word of mouth. Some consumers also don't like the idea that resellers are using other companies' networks, even though they pay the carriers a negotiated wholesale price for that use. So Coextro is also building its own fibre optic network. It offers a fibre plan with download and upload speeds of 250 mbps for $50 per month. Bell's fibre plan with 150 mbps down and 50 mbps up is $104.95 per month, after an initial discount period. With so many Canadians sticking with the big players, even in the face of discounts from smaller ones, there's little reason for the large companies to lower prices, said Winegard. "They know they have their consumers. They know they can get those prices from those consumers. Those consumers are entrenched in routines and habits and behaviours that they trust, and so ultimately that's why they won't switch.